A human rights defender, Berta Cáceres, was assassinated in her home on the 2nd March. 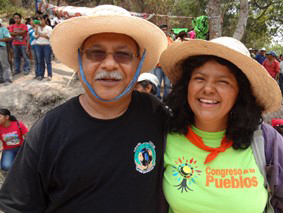 She was one of the leading organizers for indigenous land rights in Honduras and a dear friend of Radio Progreso in Honduras, a Jesuit organization. She was involved in a grassroots campaign that successfully pressured the world's largest dam builder to pull out of the Agua Zarca Dam. She was the leader of the Council of indigenous peoples in Honduras (COPINH). She had recently received the 2015 Goldman Environmental Prize for her commitment (see video). Her murder has appeared in international mass media. Radio Progreso published a note on her death. You can read the news on BBC.